seqkit. (Go). Version v0.3.1.1. Compiled with Go 1.7rc5. fasta_utilities. (Perl). Version 3dcc0bc. Lots of dependencies to install. fastx_toolkit. (Perl). Version 0.0.13. Can't handle multi-line FASTA files. pyfaidx. (Python). Version 0.4.7.1. Not used, because it exhausted my memory (10G) when computing reverse-complement on a 5GB fasta file of 250 bp. A Python script memusg was used to compute running time and peak memory usage of a process. 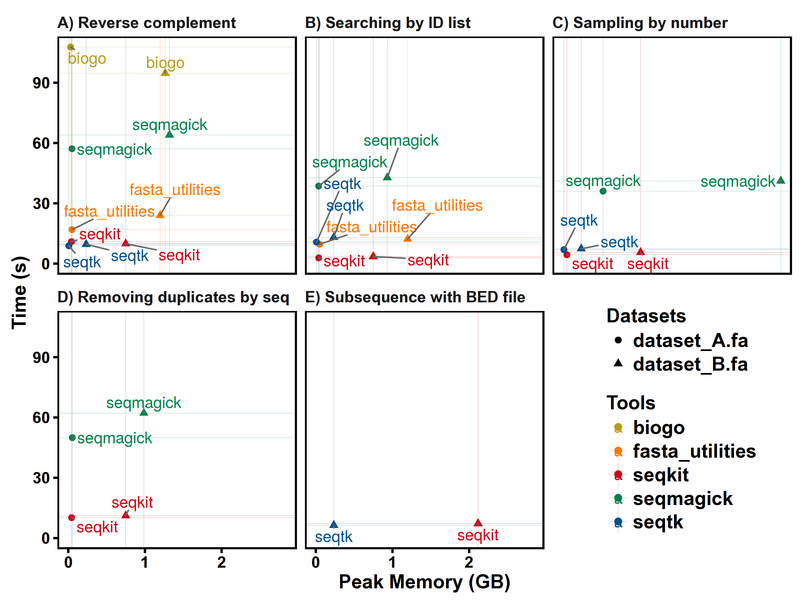 Note 2: See usage for detailed options of seqkit. Dataset A is reference genomes DNA sequences of gastrointestinal tract from NIH Human Microbiome Project: Gastrointestinal_tract.nuc.fsa (FASTA format, ~2.7G). Dataset B is Human genome from ensembl. Genome DNA: Homo_sapiens.GRCh38.dna_sm.primary_assembly.fa.gz (Gzipped FASTA file, ~900M) . Decompress it and rename to dataset_B.fa (~2.9G). 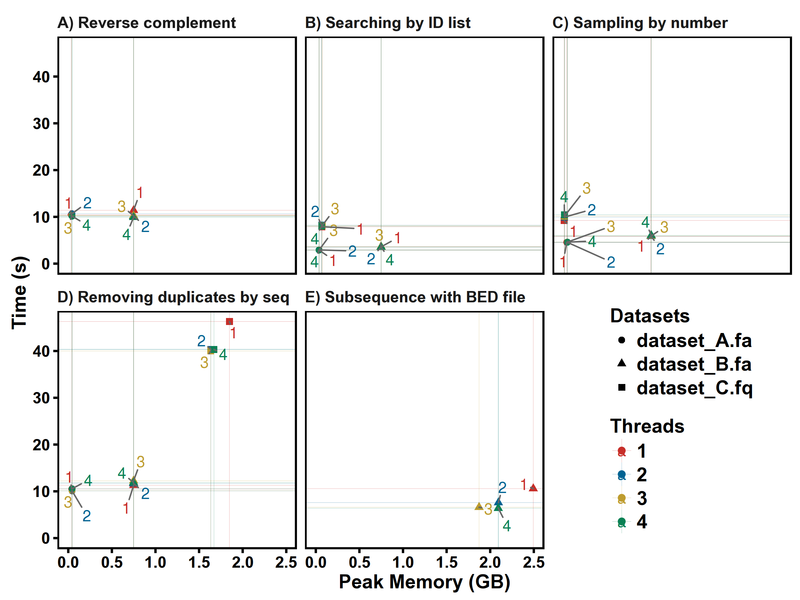 Dataset C is Illumina single end (SE 100bp) reads file (~2.2G). Parts of sequences IDs was sampled and shuffled from original data. They were used in test of extracting sequences by ID list. Automatic benchmark and plotting scripts are available at: https://github.com/shenwei356/seqkit/tree/master/benchmark. All tests were repeated 3 times, and average time and peak memory ware used for plotting. All data were readed once before tests began to minimize the influence of page cache. 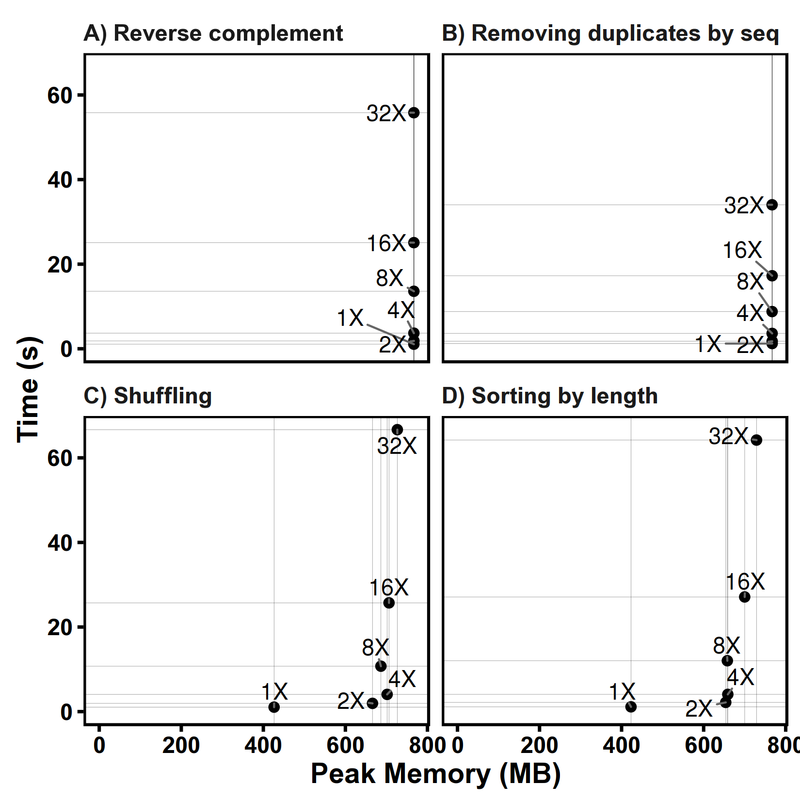 Output sequences of all softwares were not wrapped to fixed length. revcom_biogo (source, binary ), a tool written in Golang (compiled with Go 1.6.3) using biogo (Version 7ebd71b) package, was also used for comparison of FASTA file parsing performance. Note that some softwares (fasta_utilities and biogo) have different converting rules of computing complement sequence on ambiguous bases, there fore the results are different from others. 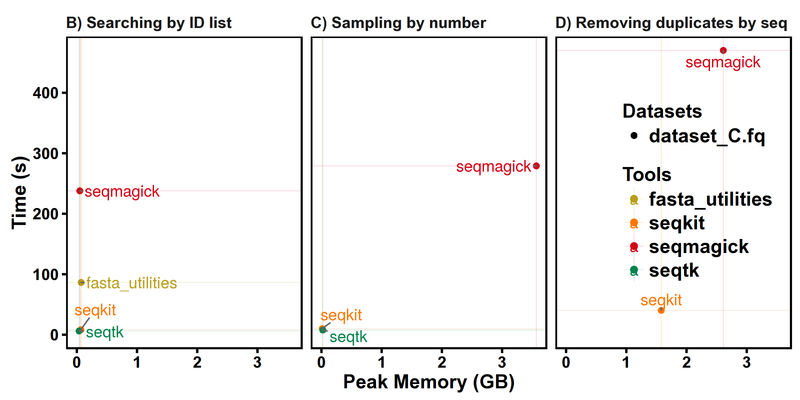 Note that different softwares have different sampling strategies, the peak memory depends on size of sampled sequences and the results may not be the same. From the results, 2 threads/CPU is enough, so the default threads of seqkit is 2. Files are generated by replicating Human genome chr1 for N times.